We all know I LOVE compression socks. I love the idea of knee high colorful socks that serve a purpose. But I also like compression sleeves so that leaves my feet bare. Enter My Soxy Feet! Every single sock has a special meaning and a cause behind in. And like they say, you don't have to match to be a pair! My very first pair for example. They are silky and feel like butter on your feet! The United socks! A portion of sales will be donated to One Fund Boston. I also won a pair of these in a Giveaway! Anything that says "Run with It?," I want! So as always, I am giving you a chance to win a pair. I really want you to pick the United socks in time for your 4th of July run but you can pick anyone you want. I can't wait to see which one you pick and choose to be inspired by! Enter via Rafflecopter! Prize will be shipped directly from My Soxy Feet. Good luck and I hope you are Inspired through your Soles! You can use Code SOXYFRIENDS for 20% off any pair even if you don't win! 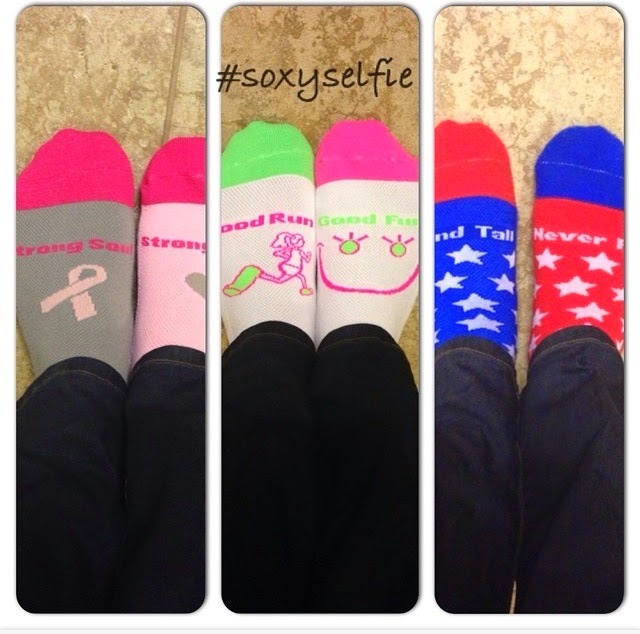 Maybe you can take your own #mysoxyselfie! looks wonderful. I will have to make sure I have a pair when doing my 5k next month. I have to keep those blisters away. They are so comfortable Tammy! You will LOVE them!